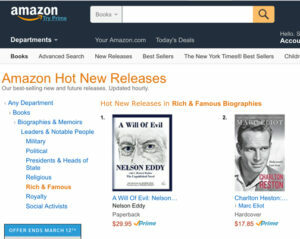 “A Will Of Evil” #1 Amazon hot new release! 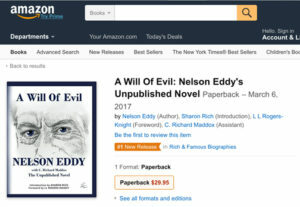 NOTE: This book is out of print as of November 2017 and is no longer available to order. November 2016: A dubious honor indeed; Jeanette and Nelson made it into the “rags” twice! And what’s even more surprising, the information about them is true! The first magazine has a cover story about “What’s true & what’s false: Hollywood’s most scandalous rumors!” Among stories about Shirley Temple, Clark Gable, Rudolph Valentino, Joan Crawford, Bette Davis and others; lo and behold, they mention Jeanette and the fact that LB Mayer ordered her to have an abortion BUT that she miscarried Nelson’s baby…see below. And then, in another tabloid there is a cover story about Shirley Temple, “What the World Never Knew.” The article opens with “a murder attempt” that we are very familiar with, her 1939 radio debut with Nelson…and the magazine has small photo of the two together on that broadcast! 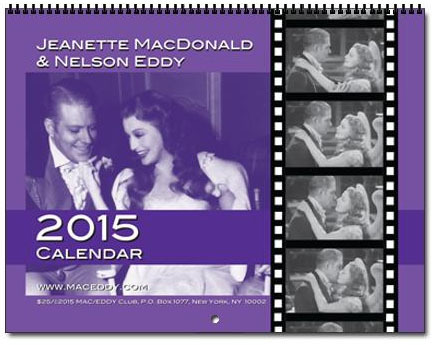 Jeanette & Nelson 2015 calendar! The new calendar is being shipped this week! Once again, each month has an amazing photo of Jeanette and Nelson together plus dozens of important and trivia dates and facts about their lives. The gorgeous cover was designed by our friend Don Schumann. As always – a winner!